I found a website that indicated they were the actual band Mestizo which began in the SF Bay Area in the 70’s. But I’m not quite sure if it’s the same band that’s on this 45. 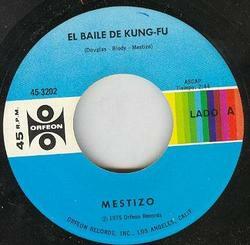 Irregardless, it appears that Mestizo was riding the coat tails of Carl Douglas’s one hit wonder “Kung Fu Fighting” and “Dance The Kung Fu“. A popular song and/or topic to cover at the time i guess. I’ve heard other Latin American versions, as well as Jamaican reggae funk versions too. This is a 45 I pulled a few weeks back from that KRMX collection which I was speaking of in the last post. It’s pretty indicative of the collection as a whole. I’m always getting surprised. It ain’t the best song in the world, but it’s pretty ridiculous and amazing in its own right. Please note that I created by own genre “Queso” (cheese). It’s a pretty subjective category since I tend to stick music that resembles nacho cheese into it. There is so much Latin cheese-ball that a category was warranted.